A former newspaper office that looks like a swimming pool. What on the face of things is a small commercial site on Deansgate, you’ll find a beautiful building complete with wrought iron balcony and decked out inside with personalised bottle green ceramics. Look above Topkapi and the model shop on the corner of Bootle Street and Deansgate and not only will you spot the golden sign bearing the name ‘Onward Building’ but below a tiny, ornate white balcony and above the entrance are the words 'Band of Hope' inscribed on a keystone above the face of a cherub. The site of The Onward Building was previously Number 1 Court and just next-door, 201 Deansgate, had been the site of a Quaker burial ground. Finished in 1904 by architect Charles Heathcote, this building was occupied by a federation of temperance societies. This particular temperance movement was started in Leeds in 1847 and aimed to save working class children from the perils of alcohol. The Band of Hope society published a paper aimed at children under the title Onward, hence the name of the building. The paper warned the readers to be on constant guard from temptation and promoted the temperance movement by publishing moral tales and poetry. It’s perhaps easily forgotten that children were also the victim of alcoholism in these times of poverty and child labour, the movement became hugely successful with 2 out of 8 million children of Band of Hope age taking “The Pledge” in the last decade of the 19th century. If you step back a little and look further upwards, you’ll notice the third-floor windows are all porthole style. Behind these is a most splendid room, with the air of a Victorian bath, a raised stage at one end and ceramic tiles all around the room bearing the inscription of all the people who contributed in some way to the erection of this particular office of the Band of Hope. Manchester had many ties to temperance over the years and it was in 1851, in America, the Maine Law was passed; one of the first statutory implementations of the temperance movement in the states. This passage of the law, which prohibited the sale of all alcoholic beverages except for “medicinal, mechanical or manufacturing purposes” quickly gained recognition overseas and it was the inspiration for the United Kingdom Alliance here in Manchester, who aimed to outlaw the sale of alcohol. In honour of the movement, a street known as Dog Kennel Road was renamed to Maine Road, this street is perhaps most well known in modern times as the site of the Manchester City football ground for 80 years between 1923 and 2003. To further support the movement many temperance bars were set up around Lancashire, these bars were allowed to open on Sundays despite laws at the time prohibiting trade. It was in these temperance bars that Vimto, or Vim Tonic as it was then known, was first sold. Invented by John Joel Nichols, Vimto was sold as a health tonic and was manufactured at 49 Granby Row, the site is no longer there but there are signs of the movement all around this area. 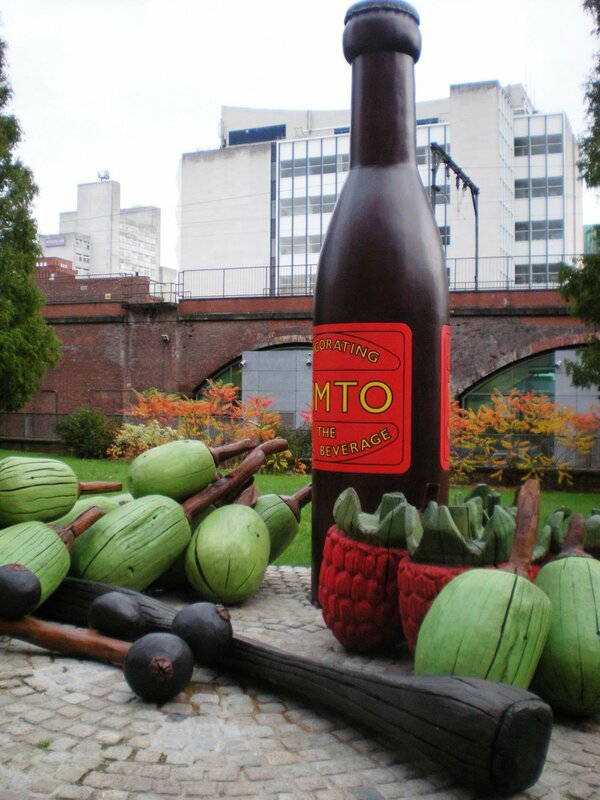 The most obvious sign being the Monument To Vimto, an oak sculpture by Kerry Morrison that was unveiled in 1992 and towards the back end of 2011 it was given a new lease of life and now sports a colourful painted finish. You can find the statue, owned by UMIST, besides their Sackville Building. On Fairfield Street, adjacent to London Road fire station, and right next door to the Bulls Head pub, is another Charles Heathcote building dating from 1902. If you look up here you can see above the doorway the words 'The Manchester Coffee Tavern Company Limited'. Coffee was cited by doctors at the time as a cure for alcoholism and was another step in the movement against alcohol. Coffee Taverns distributed tokens to the poor, the tokens were only redeemable at their taverns, and this method hoped to keep business out of licensed premises. Manchester Coffee Taverns opened in 1873 and eight premises in total were racking up to 65,000 visitors per week, eventually more were opened until around 15 branches stood throughout the city - even providing separate rooms for juveniles in order to restore public order on the streets. Although this building is quite an unassuming one, and coffee houses didn’t fare as well as temperance bars seemed to, there was still high demand for them early in the 20th century and the Athenaeum served only coffee for many years whilst boasting a membership, in 1913, of 2,250 people and an esteemed clientele at that with regular visits from Charles Dickens and Benjamin Disraeli. 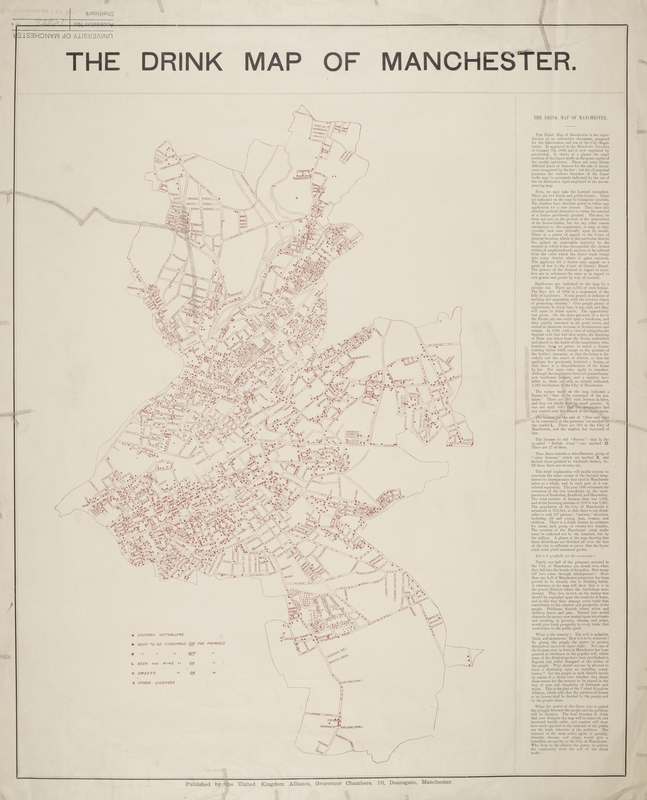 According to The Drink Map of Manchester, originally published in The Manchester Guardian January 1889, there were 2,585 licensed premises across Manchester, which equates to 1 drink seller for every 107 people. You can also spot on this same map, (shown below overlayed with a recent map) that Fairfield Street has since been extended and it now cuts across the site of the Bulls Head, slicing a corner from the building which called for a remodel of the site and thus explains the peculiar shape of the lounge bar to this day. Following Fairfield Street as far as the Star and Garter you will eventually come to Temperance Street, a rather insalubrious looking street following the path of the train tracks from Piccadilly Station. Ironically, many temperance venues were eventually converted to bars, an example of which is The Sedge Lynn on Manchester Road in Chorlton. A venue that was built as the Temperance Billiard Hall and remained as a snooker club until the 1990s when the Wetherspoons chain took it over. The Co-Op Funeral home just next door was the site of a Savoy cinema, and although heavily altered both inside and out, the room in which coffins are stored today retains the original ceiling. There is one surviving original temperance bar in the UK to this day, Mr Fitzpatrick’s in Rawtenstall.